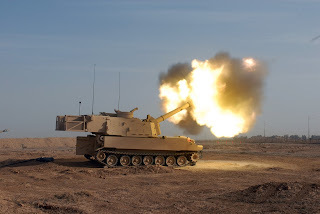 JAKARTA, -- The Indonesian Army (Tentara Nasional Indonesia - Angkatan Darat, or TNI-AD) has requested for funding allocation from Jakarta to acquire up to 20 units of the M109 Series of 155 mm self-propelled howitzers to augment the service's indirect-fire support capabilities. The request was disclosed in a transcript of a meeting on the country's defence budget for 2017, and reviewed by IHS Jane's on 18 August. "The objective of the acquisition is to meet the TNI-AD's current requirement for such a platform", said the transcript, which has however given no details on where the TNI-AD plans to acquire the artillery systems from. The US Army M109A6 'Paladin' 155mm self-propelled howitzer.